Before she criticizes Russia and Iran, the US ambassador to the UN Nikki Haley should recall the US foreign policy which has led to conflict across the Middle East, Iranian Foreign Ministry Advisor Hossein Sheikholeslam told Sputnik. The US will continue to pressure Russia and Iran because of their support for Syrian President Bashar Assad, who the US still wants to remove from power, US ambassador to the UN Nikki Haley told ABC News on Sunday. The US does intend to try and work with Russia to defeat Daesh, but Russia is "on notice when it comes to certain issues," Haley said, adding that she is "beating up on Russia." "We need to start putting pressure on Russia and Iran in terms of the fact we need to get Iran out of there (Syria). We need to get the Iranian influence out of there," the ambassador added. The US still wants to remove President Assad from power, Haley said. "Our goal is we want to bring Assad to justice. We want them to pay for the crimes that he's done. We're going to continue to let Russia know how dangerous it is to keep Assad in power," she declared. Advisor to the Iranian Ministry of Foreign Affairs Hossein Sheikholeslam told Sputnik that the US needs to remember its own history before criticizing Russia, Iran and the Syrian government. "Such statements are made, unfortunately, by people who have lost their minds and don't follow any kinds of laws or norms. The Americans still think that since the Second World War, when atomic bombs were dropped on Hiroshima and Nagasaki, they can keep the whole world in fear. But they need to understand the world has changed," Sheikholeslam said. "The US needs to understand that now they can't scare other countries by dropping a bomb like they did 60 years, they don't scare other countries. The US has to act within international law," he said. "Over the past 6 years, the US has committed countless crimes in Syria, but even these crimes did not allow the Americans to fully realize their plans in Syria. They only created extremism, fostered terrorism, which because of its uncontrollable nature will sooner or later return as a boomerang and destroy them." "Meanwhile, Russia and Iran are jointly fighting terrorism in Iraq and Syria. Their actions have been very successful. The co-operation between our two countries resulted in a successful round of negotiations in Astana. For the first time in a long time, an agreement was reached on the establishment of a ceasefire." Heikholeslam pointed out that Russia and Iran are participating in anti-terror operations in Syria at the request of the Syrian government, and described the presence of the US and other military forces as a "flagrant violation of international law and the UN Charter." "The United States must realize that the time for organizing insurgencies has passed — both in the countries of the [Middle East] region and elsewhere on the planet," Sheikholeslam said. 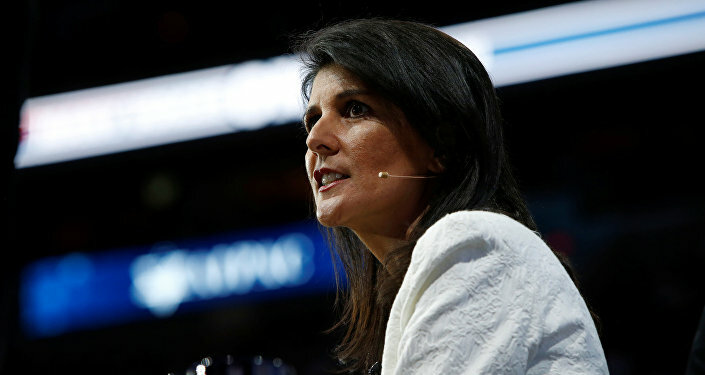 Haley appeared to have changed her position on the Syrian President since Thursday, when she had said that the US priority in Syria is no longer removing Assad from power, a departure from the policy of the Obama administration and some European countries. "You pick and choose your battles and when we're looking at this, it's about changing up priorities and our priority is no longer to sit there and focus on getting Assad out," she told reporters in New York. Russia has repeatedly asserted that Assad's future is to be decided by the people of Syria, a position which Secretary of State Rex Tillerson appeared to agree with on Thursday in Ankara. “I think the… longer term status of President Assad will be decided by the Syrian people,” said Tillerson at a joint conference with Turkish Foreign Minister Mevut Cavusoglu.